Welcome to Big Island of Hawaii……. Big eruptions since the Kilauea Volcano lava dropped out of sight about two weeks ago. The whole floor of the cauldron dropped out of sight and emerged underground and came up in Leilani Estates. Folks had to be evacuated because of all the dangers. Some folks lost there homes to Pele, The Goddess of the lava. There are many fissures that have opened and covered several miles of land and more folks had to be evacuated. Only one report of someone getting hurt from flying lava, that shattered his leg. Many folks have been displaced to shelters and or folks who share there home. Most folks who have been evacuated may not be able to go back to their homes for many weeks or months. Lots of roads are closed as well. 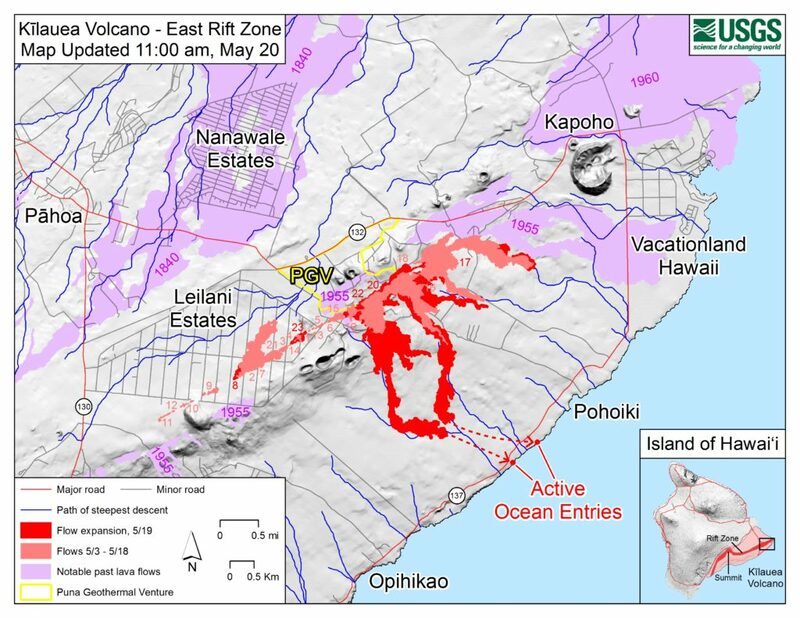 As you can see from this map, the lava started in Lelani Estates and moved east. The latest dangers are the high toxic glass particles and fumes from the lava falling into the ocean. Scientists believe that even hotter lava will be present and spread more. Let’s all ask madam Pele to slow her pace in her efforts to find her lost love. Remember lava is dangerous so keep away and please do not take home any lava rock souvenirs. Bad Luck!